Do you want to run better, faster, longer and stronger? Do you dream of being that runner where every step of every mile is 100% pain free? No aches, no twinges or niggles, no lingering soreness from yesterday’s session. Research shows that as many as 79% of runners get injured at least once during the year. That means that nearly 8 out of every 10 runners you see at your next race have been or will be injured sometime that year. Often a little rest now, or reduction in training mileage and intensity, with some treatment, can prevent a lot of time off later. Developing a proactive long-term injury-prevention strategy can help keep you in the ‘green.’ You should include strength training, stretching, regular massage and foam-rolling. Physical therapy is a lot like homework, not all of us like having to do it, but if you don’t do it, you’re sure to get in trouble at some stage! So What Causes Running Injuries? With running being the key risk factor for running injuries what other factors influence risk? We used to place a lot of emphasis on intrinsic factors like leg length discrepancy, pronation (flat foot), high arches, genu valgus/varus (knock knee or bow legged). It also easy to blame extrinsic factors like ‘special’ running shoes being stability shoes or anti-pronation shoes, lack of stretching. However, recent studies have shown there is no one specific risk factor that has a direct cause-effect relationship with injury rate or injury prevention. Whilst warming up, compression garments, acupuncture and massage have some evidence in reducing injury rates it is all a little grey. Leaving you with a multi-factorial buffet of probable contributing causes to running injuries. There is however one specific factor that has been proven, and that is training error. Estimates suggest that anywhere from 60 to as much as 80% of running injuries are due to training errors. Runners become injured when they exceed their tissues capacity to tolerate load. A combination of overloading with inadequate recovery time. Poorly perfused tissues, such as ligaments, tendons and cartilage, are particularly at risk. These tissues adapt more slowly than muscles to increased mechanical load. Factors that affect how much training load a runner can tolerate before injury will also have a role. There are 2 key factors that appear to play a part in this – Body Mass Index (BMI > 25) and history of previous injury, especially in the last 12 months. While high BMI and previous injury may reduce the amount of running your body can manage, strength and conditioning is likely to increase it. There is a growing body of evidence supporting the use of strength training to reduce injury risk and improve performance. Training error and injury risk share a complex relationship. It may not be that total running mileage on its own is key but how quickly this increases, hill and speed training. The old saying of “too much, too soon” is probably quite accurate. Injury prevention is really a ‘mirror image’ of the causes of an injury. So, if you understand the primary reasons for getting injured then you are heading in the right direction to staying healthy this running season. You can find out more on injury prevention, with recommended exercise leaflets, at the links below. Body tissues such as muscles and tendons are continuously stressed and repaired on a daily basis. This is a result of both ‘normal’ functional activities and sport. An overuse injury often occurs when a specific tissue fails to repair in the time available, begins to breakdown initially at microscopic level and then over time develops into a true injury. So, the first time you feel a soreness, a stiffness or a pain is not necessarily when it all began. The most common injury is ‘runners knee’ or patellofemoral pain syndrome and accounts for over 40% of running injuries. This is followed closely by plantar fasciitis, Achilles tendinopathy and then ITB (iliotibial band syndrome), shin splints and hamstring strain. These injuries generally need complete rest or at least a reduction in training volume and intensity. Followed by physical therapy to promote tissue healing and mobility. Although these are overuse injuries there is frequently an underlying muscle weakness and/or flexibility issue that needs to be addressed with specific rehabilitation exercises. 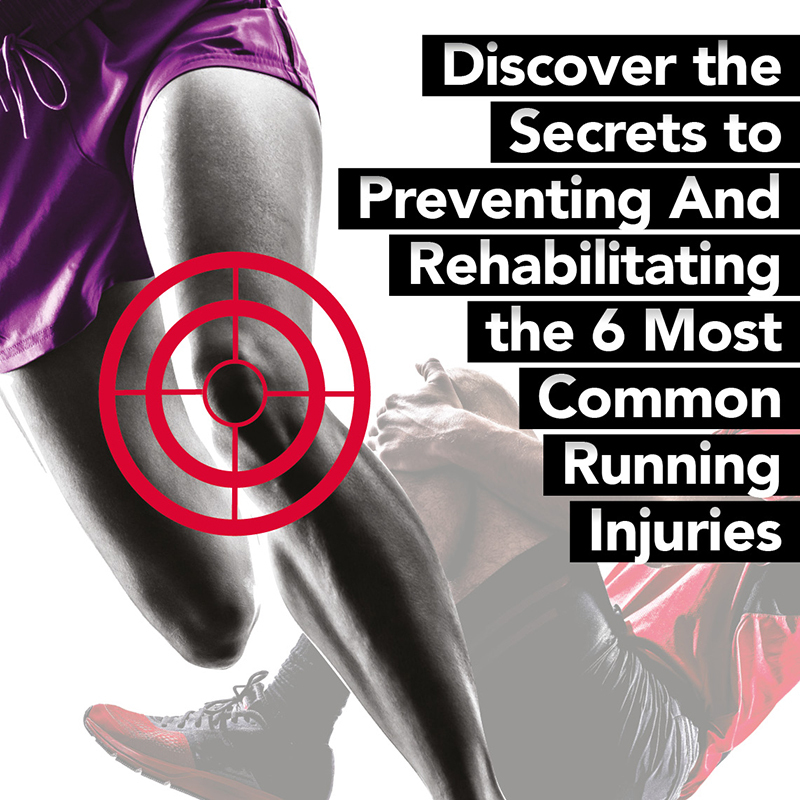 Follow the links to find more specific information about each of the most common running injuries with specific rehabilitation leaflets for you to use. While guidance can be given, it is general in its nature, whereas individual complaints may need individual attention. If you do pick up an injury that you’re worried about we can help, the sooner it’s treated the better.